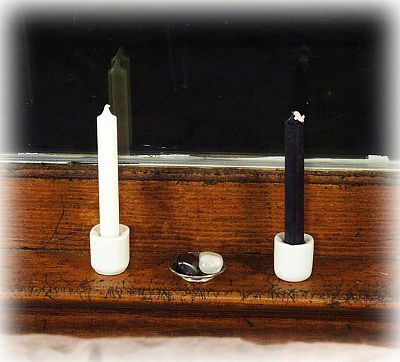 - This one is about as simple as it gets-- a window ledge holds black and white candles, and a pewter bowl with a Yin/Yang design in the center. The bowl holds tow tumbled stones-- a black hematite and a white quartz. If you're prone to going overboard in some areas of your life, an altar like this one can bring you back to your center. Do you have any other questions about our Balance Altar? I like this simple almost Zen approach to an Altar...Fits any where and ideal for people/space that might no be quite out fof the broom closet..! Simple yet symbolic. It may not reach the level of an Altar, but it does met the needs of the user. A good beginning. Now that's cool. I'm a sucker for mini things, and this takes it to the wonderful extreme. Plus it's nice for when you're not home, easy to take along and everything. i think it is a good idea to put onto an alter but not be a certain alter itself.